Hi! 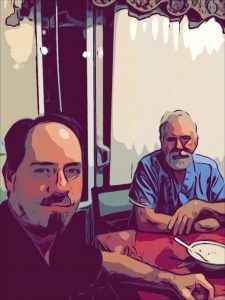 We’re Jay and Craig, inventors of the Cable Wrangler. 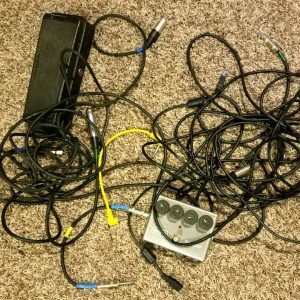 As gigging musicians, we grew tired of the tangled mess of microphone cords and speaker cables we found ourselves battling before and after every show. The milk crate we used to store and transport our cables seemed to have the magical ability to turn perfectly rolled cords into a disorganized mass of snarled knots, a process we now refer to as spaghettification. We knew there had to be a better way. 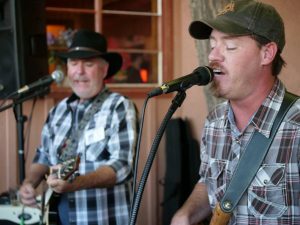 We sound as good as we look! So we toiled. We beat our heads against the problem of spaghettification. We scribbled drawings onto napkins. 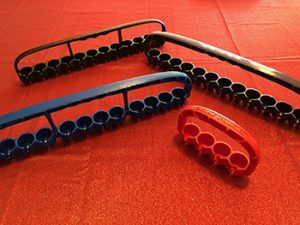 We pestered our friends who know how to use 3-D printers. We tested our designs in the crucible of the modern American household, where the solution to spaghettification continued to elude us. Months later, in a flash of Jack Daniels-enhanced inspiration, Craig saw the answer. Quickly cancelling development on the latest prototype, and aided with the revelation of the power of the Bungee Ball, we forged ahead with a new concept. 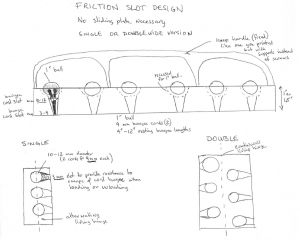 Early concept – we call this the “Dog Leg & Velcro” design. Someday this will be framed in a museum, probably in France or Italy. 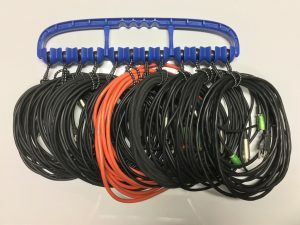 And so, after a dozen designs, seven prototypes, and a year of development, we’re pleased to introduce the Cable Wrangler: a simple and elegant solution to the problem of all-purpose cable management. We are finally able to make short work of disorganization, transportation, and despaghettification of all kinds of cables, cords, ropes, and any other long stringy things you might have to deal with in daily life. 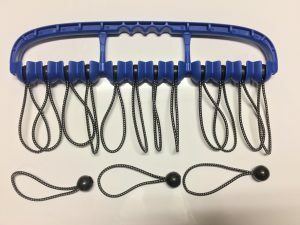 Used in coordination with our custom-built Bungee Balls, the Cable Wrangler can effortlessly organize, store, and transport up to twelve cables of virtually any size or weight. Since the cords hang in plain sight, your go-to guitar cable can be easily removed, without having to be disentangled with your favorite mic cord. But don’t be fooled! 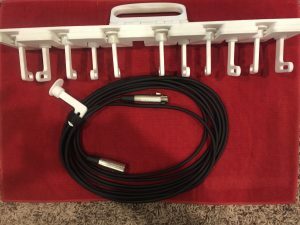 The Cable Wrangler isn’t just for musicians: anyone that needs to organize extension cords, hoses, networking cables, Christmas lights, or even rope, can benefit from the organizational bliss delivered by the revolutionary Cable Wrangler. As we like to say, Why Tangle When You Can Wrangle? The winning design, now available to order! Get those cords wrangled for good!